Whoa. Now that is awesome. Birthday presents! 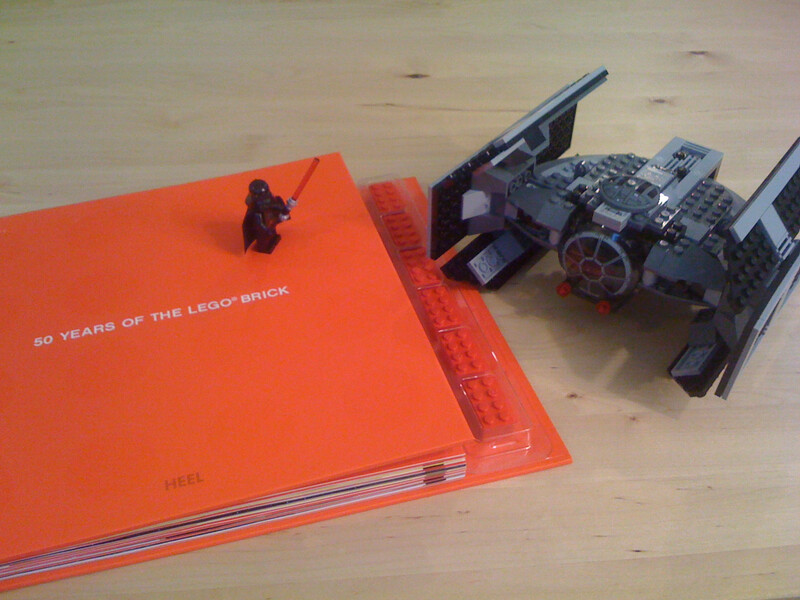 TIE Advanced from my wife, book from my sister. And my parents got me Swiss Army knife—it's like I turned 13, not 30. Crazy last minute, but if anyone in NYC has kids interested in Legos this would be awesome. As part of the grand opening for their Rockefeller store, Lego is building a cityscape with an enormous Big Apple in the middle of it. The cool part is that they are having kids put the pieces together to form the apple. That's awesome. And happy belated b-day! I saw this on Penny Arcade. It is called Creationary. It's like Pictionary but with legos! The hood area of the second car for instance, I think. In my case, if a block substitutes a form/shape you could replicate with smaller pieces then it falls into the custom-y camp. It would also mean "any cool/weird looking block I didn't play with when I was 12 ", that pretty much defines those fancy cars as very custom-y for me. However, you're right, from here it looks like you can use those blocks for anything, which is cool in my book. I've only skimmed, so this may have been said already, but the absolute best thing about having a son is being able to do this again. I don't know if anyone else has found this, but kids today seem to be less willing to make up their own stuff with Lego than I was when I was a kid. He generally gets a set, assembles it as per the instructions, and puts it on the shelf and plays with it occasionally until it gets broken, and then puts them in the big box of loose lego and then leaves it. I've been encouraging him, but it takes a lot of time to build something that looks as good as a set (just because you have to find all the right colours for everything) and he doesn't have the patience. I've been eyeing up Mindstorms. They're not cheap, but they look like they could have a lot of potential. He's got a hankering to build a motorized robot (something of which I heartily approve). My youngest has a bunch of legos, and he's willing to break a set down, but his imagination seems to be either wilder than mine, or he has little concept of design. It's probably a combination of both. That truly tingled all my nerd senses. I've only skimmed, so this may have been said already, but the absolute best thing about having a son is being able to do this again. I don't know if anyone else has found this, but kids today seem to be less willing to make up their own stuff with Lego than I was when I was a kid. It took my son a long time before he wanted to do anything other than just build from the instructions. He's almost 10, and it's really only been in about the last year that he's started coming up with his own ideas. My 4 year old has custody of a chunk of my collection now. I love seeing him come down from his room with his new car or spaceship. He does not keep built things for long, they end up modified or dismantled to add to a new creation. I love that he is always creating new stuff, but I get a little sad when he guts MY spaceship. I bought this one for Kepheus as a "hurrah for your new job!" gift - he loves it. We have Vader standing on top waving his light saber at an alien who has just robbed a bank (from the Space Police set). For me, Lego was all just random pieces out of a large paper grocery bag (and my grandmother threw in some little plastic farm animals so we could build farms if we wanted). My sister and I once built a grocery store, complete with those conveyor belts that took your groceries to the loading area so some bored looking teenager could load your stuff into your car. We filled the boxes with tiny plastic farm animals and crumbled Oreo cookies. 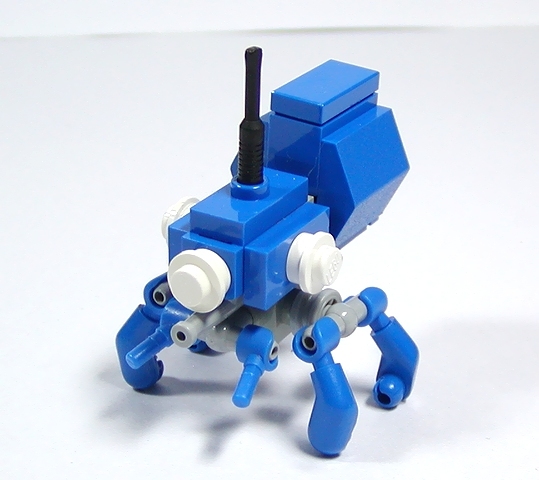 Just thought I would revive this thread to point out this model to all the LEGO maniacs out there. Wow. That's really impressive. I went on the creator's blog to see if there was a reference photo he was working from, and ended up reading the whole thing (not very long). His first post is really enlightening, as he had put a lot of thought into the philosophy of what he wanted to build and how to present it. He must have some sort of art background already, and LEGO is obviously a pretty effective medium for him. 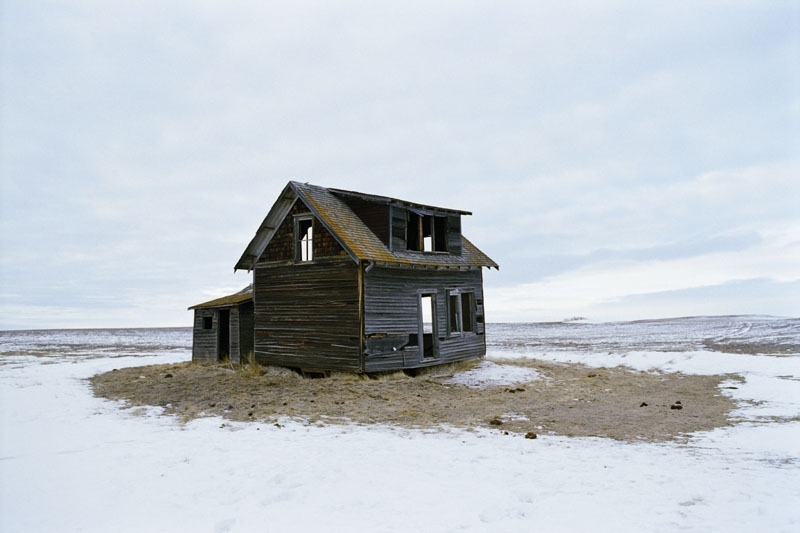 A straightforward image of an abandoned home is void of any intention or meaning. There is no story being told here. But there are many that can be imagined. Was the family driven out of the property? Did they lack money? Did someone die? War? There are no answers here - only pure form. It is this ambiguous approach to narration that I enjoy. His piece is a lot like Eugene Richards' photography. [W]hen too much is revealed or obvious at once, I tend to move on to the next piece quickly. When I have invested a little time examining, I have a connection to the piece more so than if it comes to me in one quick blast. It is that tension when at first you are not exactly sure what something is and then it 'clicks', the lightbulb goes off and you see it. I've 'figured it out'. Micro works tend to behave in this manner, where the viewer is invited to decipher the (hopefully) clever reduction of form and purity. Such moments are special and remembered. If you haven't already seen it, this little talk on Lego is great. edit: Also this my favourite set growing up, although weirdly I'm not able to find a photo of the original, only this photo of a 3D rendering of the original. I got a hankering not so long ago to attempt to model some of the ships from Eve online in Lego. Probably quite costly to put together though. Ha, that was awesome, thanks for sharing that! Try digging around here for your truck set. They maintain a pretty comprehensive database. This looks very similar to that truck, but it's not exactly the same. Yup, I had (er, still have) 5580, the other Model Team highway rig. It had the same steering mechanism. I thought 5590 would've made a great companion for it but my parents, who had a better idea of money than me at the time, disagreed. http://peeron.com also has a set inventory, and a parts listing. http://brickset.com is another good resource. Having just bought 4 fairly large Lego sets at the age of 36, I have to answer no. I built this and it was a great build. The older you get, the more enjoyable building becomes. Set up a small table in a quiet corner of the house where you can sort out the pieces and get building. Nothing wrong at all. I think the new Kingdoms sets are their best medieval stuff yet, and now that I have all the Star Wars sets I want, I'm interested in getting some of those.